We create our lives. We interact with life in a very specific way which produces a very specific result. When you change how you relate to life, you change what happens around you. It is relatively easy to heal relationships, resolve problem areas, and create a great life. This is because the areas of life that don't work are not the problem. They are the symptom of something deeper. The real problem is an underlying condition of resisting or hanging on. This condition creates a state of fear, upset, and tunnel vision. It destroys our ability to see clearly and keeps us from finding solutions. It makes us defensive and magnifies the problem. In relationships, this condition destroys love and creates conflict. Fortunately, it's relatively easy to find and remove this destructive underlying condition. The moment this happens, you experience a wonderful freedom. Solutions appear and this area of life begins to clear up. It is possible to have love in every relationship and in every aspect of life. Bill Ferguson can show you how. As a former divorce attorney, 15% of his clients never divorced and the ones who did were able to part as friends. The producers of Oprah were so moved by his work that they featured him on one of their shows. Media across the country call him "The love counselor." His book, How To Heal A Painful Relationship, has become a best seller. 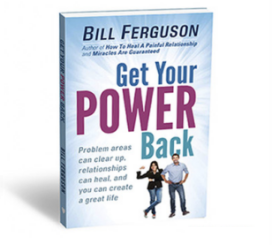 His newest book is Get Your Power Back. The Texas Counseling Association asked him to deliver the keynote address at their annual convention. He taught his concepts to over 2,300 counselors and therapists. See the beginning of the keynote. A seasoned guest, Bill Ferguson has been on hundreds of radio and television talk shows including Oprah. He was on Houston's most popular radio station, Sunny 99.1, every week for a year. He has also been recommended by both The Wall Street Journal and The Washington Post. Get Your Power Back - Find and remove the underlying conditions that destroy love and sabotage your life. How To Heal A Painful Relationship - End conflict, heal hurt and restore the love, one human being to another. Miracles Are Guaranteed - A step by step guide to having life work. To interview Bill or to obtain more information, you can e-mail him or contact him directly at 713-520-5370. You can also visit his other sites: MasteryofLife.com and DivorceAsFriends.com.